When J. Walter Becker started IDEAL Industries, Inc. in 1916, he based his family business on an unshakeable belief that building good relationships with his employees, his community, and of course, his customers was imperative for success. More than one hundred years later, multinational IDEAL INDUSTRIES, INC. continues to create some of the world’s most innovative technology but is still a family business at heart. 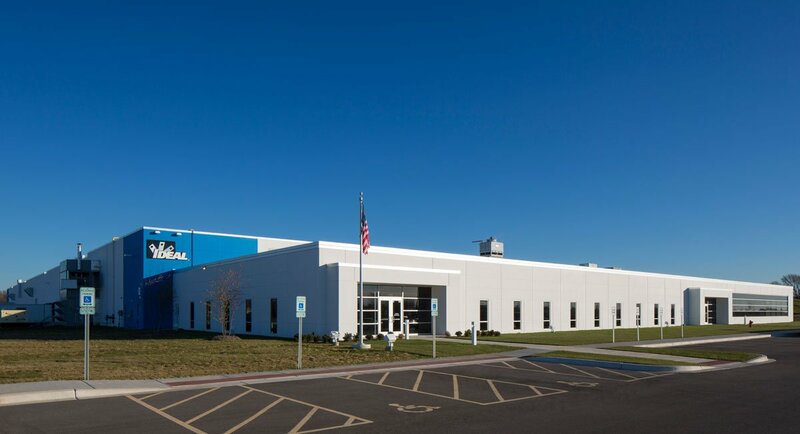 When the need arose to improve efficiencies and employee amenities at their electrical manufacturing facilities in DeKalb, IL, IDEAL realized they had an opportunity to secure their legacy for future generations by improving the overall work environment for employees. They turned to us to help them realize their vision. We had already built a 109,000 square-foot warehouse and distribution facility for IDEAL, and the chance to work with IDEAL again for their new 208,770 square-foot manufacturing and office building was one we relished. The plans called for the combination of three inter-working facilities into one centralized location on IDEAL’s campus in Sycamore, IL. The new building would streamline IDEAL’s productivity and improve general efficiencies by incorporating a 24,810 square-foot office space with a 183,960 square-foot shop complete with two overhead bridge cranes. To provide IDEAL with greater risk avoidance, construction plans also included upgraded employee amenities such as open-air markets, a gym and year-round temperature control. Meticulous planning and scheduling is key to a successful build project, but sometimes Mother Nature has other ideas. We broke ground in the spring of 2015 and almost immediately faced ongoing torrential rains. The weather threatened to derail the projects’ schedule and budget as we faced significant soil issues. But thanks to our ability to adjust, find soil remediation solutions and then sequence out the construction phases around the remediation, we were able to say on time and within budget. And the rain finally let up! From managing IDEAL’s independent contractors to continually providing multiple creative solutions to plan changes, we took care of all aspects of the build from start to finish. By maintaining daily contact with stakeholders and providing IDEAL with weekly progress meetings throughout the entire construction process, we were able to ensure a smooth construction process, and IDEAL was able to provide uninterrupted service to their clients. As a result of another successful partnership with us, IDEAL’s new facility allows them to continue their growth and innovation while staying true to the family business at heart that is committed to their employees, the community and their customers. Let’s Start Building Your Future.